These are two films I saw a while back, and I ultimately decided to release it as a double review. They might be a tad short, but I got a little writers block. Sorry about that. In this Disney film, A young kid stumbles upon a bright and glorious futuristic world that utilizes Walt Disney’s ideals of working together and always looking forward to create a better tomorrow – Wait… was I just talking about Meet The Robinsons? Well anyway, I recently took a vacation and Tomorrowland was the in-flight movie. I otherwise wasn’t planning to watch it. And.. I probably shouldn’t have watched it. The film isn’t exactly god awful, but it’s a waste of time. There’s nothing in this movie that you haven’t already seen. The visual effects can sometimes be impressive, but other times they can look pretty dated. The directing by Brad Bird is fine – the film’s problems come more from the writing than the directing. And the acting is decent all around. But what annoys me is how complex the plot is. There are a whole bunch of story elements in this film that could have been cut to devote more time to character development or the overall atmosphere. This story would have been better suited as a short film. That or some sort of interactive ride experience at Disney World, I could see that. This movie is so obviously a huge commercial for Disney World anyway, and that’s more of an observation than a complaint. I mean, look at The Lego Movie. It’s basically one big commercial, but at least it’s a good commercial. Tomorrowland is not. I would give it two stars, but one long tracking shot in particular bumps it up half a star. I’m a sucker for long tracking shots. The story of Ricki & The Flash is a fairly simple and enjoyable one. There’s nothing really wrong with it, it’s a nice enough story with a nice enough message – but it’s nothing groundbreaking either. But let’s be real here – you’re not gonna want to see this film for the directing, the writing, or even the supporting performances. 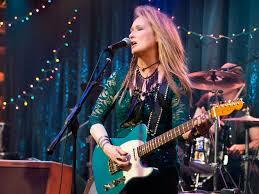 Okay, allow me to become Captain Obvious for a second here.. Meryl Streep is amazing. Now, a lot of you will try to write off this performance, saying that it’s Meryl, and that she could give a performance like this in her sleep. Maybe, but what Meryl can do in her sleep is better than what most actors can do when they’re awake. She completely owns the film, she has a lot of great moments, and if she gets nomination #20 for this film, it will be well deserved. Kevin Kline, Mamie Gummer, and Audra McDonald all turn in some strong supporting performances, but they can’t quite rise to Streep’s level. The script is pretty good, and the direction is… standard. (Is this really the same guy who directed The Silence Of The Lambs?) Really the film is solid on it’s own. It’s short, and story-wise, it’s a solid effort. But don’t kid yourself – see this film for Meryl Streep and Meryl Streep alone.